Director of the Early College Alliance David Dugger, right, explains the benefits of the ECA program to the Willow Run Board of Education during the regular board meeting last Thursday night at Henry Ford Elementary. Mar. 25, 2010 · 11:32 a.m. Starting in fall 2011, students in the Willow Run district will be able to attend the Early College Alliance (ECA) program at Eastern Michigan University. "We're very excited about the opportunity to participate in the Early College Alliance," said Willow Run School Board president Sheri Washington. "We're very committed to it." David Dugger, director of the ECA, said that the program provides a way for Willow Run to expand educational opportunities to students. The learning process works differently at ECA than in a traditional high school setting. As a non-time centric program, students in the ECA focus on skill acquisition as opposed to credit accumulation. The program cites statistics that show 84 percent of ECA students enrolled in 100-level courses at EMU passed with a grade of “C” or better. Although ECA students will attend EMU fulltime, Willow Run will continue to receive funding for those students from the state. They can also claim them as a student in the district for a fifth year. Students are also free to participate in any extracurricular programs at their home high school, including sports, as long as they maintain the academic eligibility standards of the ECA. "What really is great about it is the students remain connected to those buildings,"
Dugger said at the school board meeting last week. "[The districts] are not losing the students at all." Any student that resides within the district, including those who are home schooled, or have attended private schools in the past, may apply for admittance to the program. Dugger said approximately 23 percent of ECA students are new to their ECA district, which could potentially increase enrollment for Willow Run. 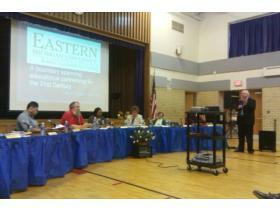 The ECA will accept between 10-15 students from the Willow Run district for admittance in the program in fall of 2011. Although there is an application process, students are chosen by lottery for admittance. Of those accepted, 30 percent of the seats will be reserved for students who qualify for free and reduced lunch. Willow Run will join several other area school districts in the ECA consortium, including Chelsea Public Schools, Lincoln Consolidated Schools, Milan Public Schools, Washtenaw Intermediate School District, Whitmore Lake Public Schools and Ypsilanti Public Schools. In 2011, Dugger estimates there will be nearly 450 students enrolled in the program. District informational meetings about the program will be announced in the fall. Ninth or tenth grade students in the Willow Run district may apply for the 2011 fall term sometime in October.